1. 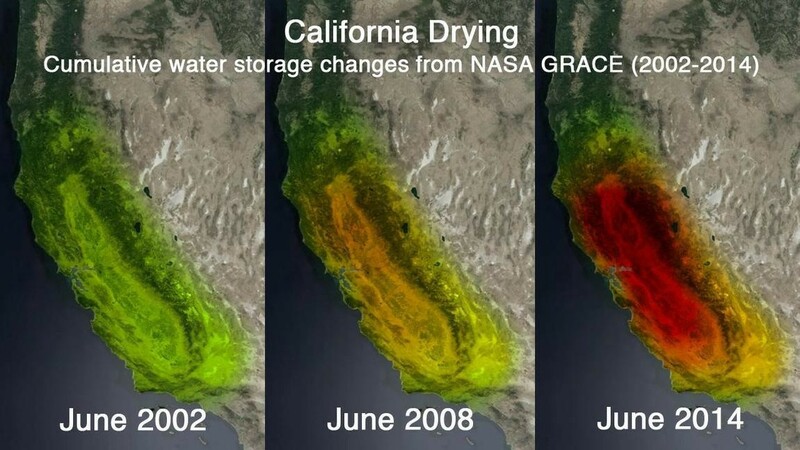 California’s record-setting drought has caused a startling depletion of groundwater in the state — so much so that it’s showing up in NASA images concerning the Earth’s gravity, the LA Times$ reports. The hardest hit areas — the ones impacting the gravity field the most — are the Sacramento and San Joaquin river basins, as the state continues to ship water from those areas to the south, mostly for use in agriculture in the dry San Joaquin Valley. 2. The Berkeley City Council moved forward this week to strengthen the city’s new minimum wage law, which raised the wage to $10 an hour on October 1, the CoCo Times$ reports. Councilmembers said the law does not go far enough because it doesn’t address sick leave, health benefits, and cost of living increases. 3. The California legislature is refusing to reveal the results of an investigation into nepotism practices in the state Senate, contending that the legislature is exempt from certain public records laws, the AP reports. The Senate’s leadership also promised the target of the nepotism probe — human resources director Dina Hidalgo — that it would keep the investigation secret as part of a legal settlement agreement with her. 4. CPUC Commissioner Mike Florio apologized for his role in a judge-shopping scandal involving PG&E, the Chron reports. Florio, however, has yet to recuse himself from PG&E regulatory matters despite the fact that he wrote emails to officials at the utility promising to help them oust a judge they didn’t like. 5. And a federal judge in Sacramento has dismissed a lawsuit filed by farmers in Midwestern states who sought to overturn California’s new rules for providing more space for egg-laying hens, the SacBee$ reports.